at the University of Delaware, January 13-18, 2008. Sponsored by the National Leadership Consortium on Developmental Disabilities. This week-long, intensive leadership development program is designed for current executive-level emerging leaders, and those who anticipate filling leadership roles in the future. Participants may work in areas of management or program leadership in organizations that provide, advocate for, or fund community-based services and supports for people with developmental disabilities and their families. Institute participants will come away with demonstrated leadership ability and a firm grasp of the values that are critical for quality, individualized supports. Faculty include: Derrick Dufresne, Steve Eidelman, Jim Gardner, Renee Pietrangelo, Julie Petty, Tim Quinn, Lynne Seagle, Michael Smull, Nancy Thaler, Nancy Ward, Nancy Weiss, and more. Some scholarships & fellowships are available! Applications are due by October 24th. Click here for more information and an on-line application. Or click on the image below for a full description. Disability Blog Carnival #23 is up NOW! Superheroes, folksongs, naked lawyers, beach wheelchairs, and a Therevada oasis--it must be another edition of the Disability Blog Carnival, with your host Jennifer Justice at Pedestrian Hostile. A fine mix of hilarity, personal accounts, serious news and commentary, there are links for all tastes. Go check it out! One of this year's newly announced batch of MacArthur Fellows is Yoky Matsuoka (b. 1971) an engineer at the University of Washington-Seattle. Matsuoka designs very high-tech anatomical models, including an intricate robotic hand, exoskeletal appliances to improve fine-motor use, and another project that uses wearable haptic devices in post-stroke therapies. Another, Jonathan Shay (b. 1941, portrait at left), is a Boston-based psychiatrist and classicist who takes humanistic approaches to psychological injury in Vietnam (and now Gulf, Afghanistan, and Iraq) War veterans. 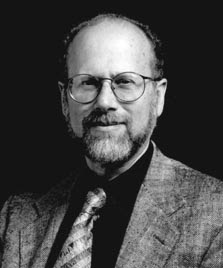 His book titles may give a good flavor of his work: Achilles in Vietnam: Combat Trauma and the Undoing of Character (1994) and Odysseus in America: Combat Trauma and the Trials of Homecoming (2002). Shay is himself a stroke survivor who has experienced post-stroke paralysis. I posted almost a year ago about Susan Burch and Hannah Joyner's research on Junius Wilson (1908-2001)--a deaf African-American man who was arrested at age 17 but never tried, was labeled insane, was placed in a state hospital in North Carolina, castrated, and held for more than seventy years. The extraordinary book Burch and Joyner co-wrote will be released this fall, as Unspeakable: The Life Story of Junius Wilson (UNC Press 2007). It would be nice to think that stories like Wilson's are safely in the past, but they're just not. Floyd Brown is another North Carolina man, also African-American, also disabled, also arrested under shady circumstances and never tried, held in the state hospital for the last fourteen years now. Carolina Legal Assistance is on the case, trying to get the murder charge against Brown dismissed, so he can be freed. "Mr. Brown has fallen through the cracks," says the CLA's Greg McGrew. No doubt about that. Smuggled Iguanas + Prosthetic Leg = News? It's still a federal crime, folks. Fly, leap or zoom over to Creativity Explored for a special exhibition straight off the pages of your favorite comic book. Studio artists reinterpret famous saviors of the universe and those who would thwart them. Laron Bickerstaff gives a new look to heroes like The Flash and Green Arrow, while Edana Contreras contributes an ode to Oracle — the only major super heroine in a wheelchair. Michael Bernard Loggins imagines his own cast of super characters including Super Toothbrush Hero, Super Serious Man and even Super Average Girl — “Trying to stay as average as she can be.” Curator Francis Kohler of Creativity Explored also contributes food for thought placing text panels throughout the show to highlight real life heroes and villains of the disability movement. Seems the opening reception will include a live band, too. 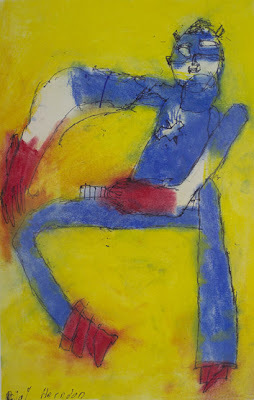 Image description: A piece of art depicting a superhero in (best I can tell) ink outlines and blue and red pastels, with an intense yellow background. The superhero appears to be running straight at the viewer, with three out of four limbs bent in a stylized "L" shape. The artist is Jay Herndon. Born on this date, English writer H. G. Wells. Wells had chronic lung and kidney troubles following a sports injury in his early twenties; he was also a co-founder of the British Diabetic Association (since renamed Diabetes UK) in 1934. His novels, particularly The Island of Doctor Moreau and The Time Machine and The Invisible Man, have fairly obvious references to eugenics and evolution, normality, science, the senses, the mind, and non-standard bodies. But his short fiction is also full of these themes. So go read his classic short story, "The Country of the Blind" (1904). Or "The Remarkable Case of Davidson's Eyes" (1895) or "Under the Knife" (1896) or .... well, three's plenty for starters. If a person is treated like a patient, they are apt to act like one. 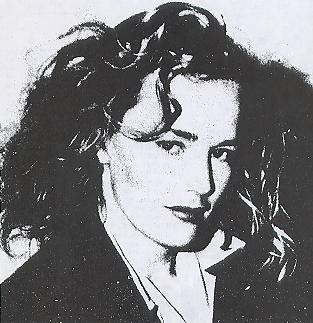 --American actress Frances Farmer, born on this date in 1913, in Seattle, Washington. Farmer was in and out of mental hospitals for much of the 1940s. She was originally committed on the basis on erratic behavior that was caused primarily by alcoholism. I didn't realize that the most sensational later accounts of her treatment have been debunked: there is apparently no credible evidence that she was ever subjected to a lobotomy, although biographies and the film Frances (1982) depict that event as a biographical fact. Disability Blog Carnival #22 is up NOW! Jodi at Reimer Reason has assembled the latest edition, with twenty-two recent posts on the subject of resilience. 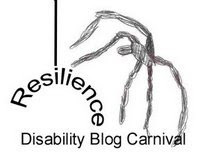 This edition has its own logo, left: a spider whose web ends in the word "resilience," with "Disability Blog Carnival" across the bottom. For other metaphors and meditations on surprising strength, bending not breaking, beauty, daring, and perseverance, go to the carnival. Next edition is due up on September 27, at Pedestrian Hostile. I'll get the theme for you soon... (UPDATE: PH says it's "Simply the Best," and invites riffs on the supercrip and related phenomena...hmmm!). Entries are due Monday the 24th; you can use the blogcarnival.com form, or leave comments here, there, wherever, to make a submission (even just putting the phrase "disability blog carnival" in your post is often enough to catch our attention). And after that, the big first anniversary edition #24 will be here, at DS,TU on October 11. I'm setting the theme for that one as "Milestones," which seems appropriate, no? Reaching them, setting them, dreading them, marking them, celebrating them--should be plenty of possibilities there. If you've got a story about hosting or participating in the Carnival in any way, that's also most welcome. 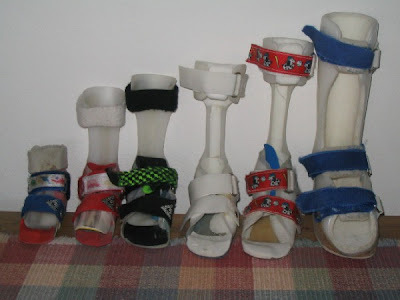 Image description: a row of six AFOs (ankle-foot orthotics) in ascending order of size (L-R), with various shapes, and various colors of foam inserts and straps). Further explanation: These are six of my son's AFOs, worn in sequence since 2000. There should be a smallest, seventh pair--his first, fitted in 1998--but those are at the Smithsonian. (I'm not kidding, they really are.) And there will soon be an eighth, biggest pair--he'll be enduring a mold-making session this Thursday. Community is made of the gentle concern that people show each other every day. It is made up of the small gestures, of services and sacrifices that say 'I love you,' and 'I am happy to be with you. '...it is taking the small burdens from the other. Jean Vanier is a Catholic philosopher, born in Geneva on this date in 1928, raised in Quebec, and longtime resident in France. In 1964, Vanier founded the first L'Arche community, in which people with developmental disabilities and their assistants live together in homes, forming a community based on mutual commitment, learning, and support. He also co-founded Faith and Light (Foi et Lumiere), a worldwide movement of forming communities to encourage people with developmental disabilities (and their families) in their spiritual lives. Vanier retired from running the International Federation of L'Arche in the 1970s, but continues to visit its many communities around the world, and lecture on the movement's ideas and practices. Jose Feliciano is a singer and musician, born blind on this date in 1945 in Lares, Puerto Rico, one of eleven brothers. He was raised in New York City. Feliciano is best known for "Feliz Navidad" (the song that means much of monolingual America knows a few holiday greetings in Spanish every December). He also hit the pop charts in 1968 with his non-traditional version of the "Star-Spangled Banner." Feliciano is married, with three kids, and lives in Connecticut nowadays. Yes, it can happen. It does happen. If you've seen stories like Ruben Navarro's, and thought, "thank goodness, that can't happen to me or my loved ones, because we have each other, some of us have medical training, we know our rights, we've made legal provisions..." --whatever you thought protected you and yours from being fatally mistreated in a hospital setting, read today's investigative report in the LA Times about the death of Linda Sue Brown. Lies were told, consent forms were forged, care was withheld, surgery (a hysterectomy) was performed on a disabled woman without appropriate consent and possibly without clear medical necessity. And nobody has been held accountable under the law. Two of her sisters were once nurses at the hospital where Linda Sue Brown died. One of them has recently persuaded the state medical board to reopen a closed investigation of the circumstances surrounding Brown's death. It can happen, and it does happen. A stronger system to protect and enforce disabled patients' rights is crucial in medical settings, because all the informal measures (a loving and informed family, nonbinding guidelines and suggested protocols, basic human decency) aren't always enough. And when those rights are violated, there have to be real consequences. American writer Sarah Orne Jewett was born on this date in 1849, in South Berwick, Maine. 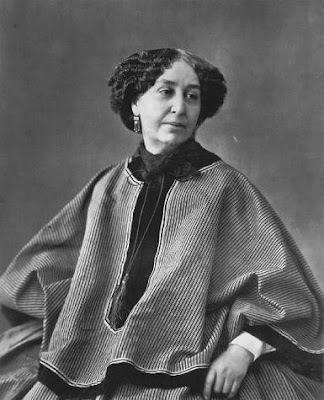 She had rheumatoid arthritis from childhood, which must have been especially difficult living in northern New England long before central heating. Brrrr. ...the Jewetts took a philosophical view of Sarah's illness, neither denying nor belittling it nor allowing to tyrannize over her life. They were sympathetic, but there was always the expectation that as soon as the pain subsided there were duties and diversions waiting, most of them outdoors. Her father believed that exercise was as important as rest in keeping the disease at bay, and she became amazingly active and sturdy, considering her handicap. A strong cross-country walker, she liked best to strike out across the fields, taking a book along, hunting out rare flowers and herbs and visiting favorite trees as if they were old friends. She was an expert horsewoman and rower, and she enjoyed skating, swimming, and coasting. You'd think it was obvious, but clearly it's not obvious at all to some people ... Nobody needs pity. Nobody enjoys being pitied--no matter what is promised in exchange. There's a reason "Piss on Pity" is such a popular t-shirt in the disability rights movement. Looking for more contemporary evidence against fundraisers that rely on pity? Check out all the other contributions to Blogging Against the Telethon, at Kara's place on Monday. UPDATE: Kara's got the blogswarm up now--great turnout! But wait, there's more good news: Kara Sheridan is already on the schedule to host an upcoming edition of the Disability Blog Carnival (in October).